The bind hot keys dialog lets users remap default hot key bindings in the editor to key combinations of their choice. Allowable key combinations include any of the keyboard keys (with the exception of escape and special function keys) and a combination of ALT, SHIFT, and CTRL. As of this writing, the bind hot key dialog is only available through Matinee. It is planned to extend the bind hot key dialog to support the rest of the editor. The dialog can currently be accessed through Matinee by the menu Edit > Configure Keyboard Shortcuts. The tree on the right side of the dialog lists all of the different editor command categories available for customization. In the image below only Matinee is available as a configurable category. After selecting a category, the list on the right is populated with all of the possible commands for that editor and the current key bindings for those commands. To bind a hot key, press the Bind button next to the command you wish to rebind and then press the key combination to bind the command to. Key bindings will not be overridden when configuration files are updated by the editor. They are stored in a separate file to prevent users from losing their key bindings when default configuration files are updated. Key bindings can be saved and loaded to external configuration files using the Load Config and Save Config buttons at the bottom of the hot key dialog. Note that ALL hot keys are saved and loaded, not just the currently visible hot key list. Keys can be reset to their default values using the Reset to Defaults button at the bottom of the dialog. This operation pulls the default hot keys are defined by programmers. Note that ALL hot keys are reset to default, not just the currently visible hot key list. 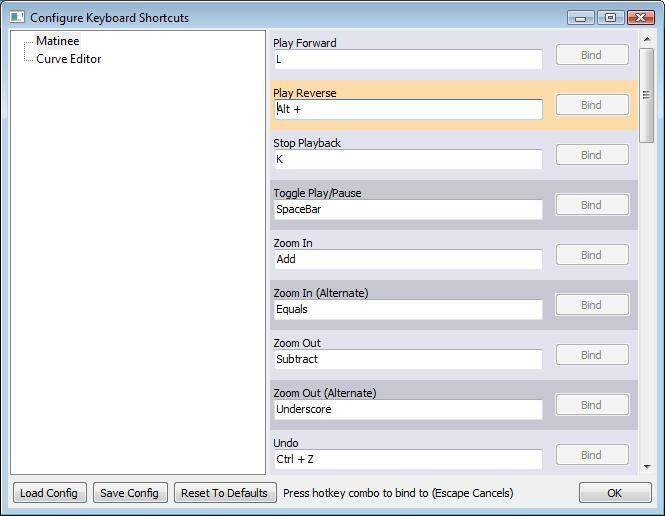 See the Adding Editor Hotkeys page for information on how to create and add new editor hotkey commands.